There are at least 8 million unique species of life on the planet, if not far more, and you could be forgiven for believing that all of them can be found in Andasibe. Walking through this rain forest in Madagascar is like stepping into the library of life. Sunlight seeps through the silky fringes of the Ravenea louvelii, an endangered palm found, like so much else on this African island, nowhere else. Leaf-tailed geckos cling to the trees, cloaked in green. 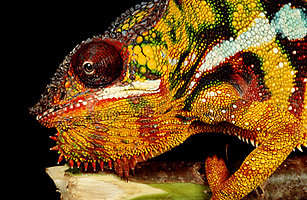 A fat Parson's chameleon lies lazily on a branch, beady eyes scanning for dinner. But the animal I most hoped to find, I don't see at first; I hear it, though  a sustained groan that electrifies the forest quiet. My Malagasy guide, Marie Razafindrasolo, finds the source of the sound perched on a branch. It is the black-and-white indri, largest of the lemurs  a type of small primate found only in Madagascar. The cry is known as a spacing call, a warning to other indris to keep their distance, to prevent competition for food. But there's not much risk of interlopers. The species  like many other lemurs, like many other animals in Madagascar, like so much of life on Earth  is endangered and dwindling fast. Madagascar  which separated from India 80 million to 100 million years ago before eventually settling off the southeastern coast of Africa  is in many ways an Earth apart. All that time in geographic isolation made Madagascar a Darwinian playground, its animals and plants evolving into forms utterly original. They include species as strange-looking as the pygmy mouse lemur  a chirping, palm-size mammal that may be the smallest primate on the planet  and as haunting as the carnivorous fossa, a catlike animal about 30 in. long. Some 90% of the island's plants and about 70% of its animals are endemic, meaning that they are found only in Madagascar. But what makes life on the island unique also makes it uniquely vulnerable. "If we lose these animals on Madagascar, they're gone forever," says Russell Mittermeier, president of the wildlife group Conservation International (CI). That loss seems likelier than ever because the animals are under threat as never before. Once lushly forested, Madagascar has seen more than 80% of its original vegetation cut down or burned since humans arrived at least 1,500 years ago, fragmenting habitats and leaving animals effectively homeless. Unchecked hunting wiped out a number of large species, and today mining, logging and energy exploration threaten those that remain. "You have an area the size of New Jersey in Madagascar that is still under forest, and all this incredible diversity is crammed into it," says Mittermeier, an American who has been traveling to the country for more than 25 years. "We're very concerned." Madagascar is a conservation hot spot  a term for a region that is very biodiverse and particularly threatened  and while that makes the island special, it is hardly alone. Conservationists estimate that extinctions worldwide are occurring at a pace that is up to 1,000 times as great as history's background rate before human beings began proliferating. Worse, that die-off could be accelerating. There have been five extinction waves in the planet's history  including the Permian extinction 250 million years ago, when an estimated 70% of all terrestrial animals and 96% of all marine creatures vanished, and, most recently, the Cretaceous event 65 million years ago, which ended the reign of the dinosaurs. Though scientists have directly assessed the viability of fewer than 3% of the world's described species, the sample polling of animal populations so far suggests that we may have entered what will be the planet's sixth great extinction wave. And this time the cause isn't an errant asteroid or megavolcanoes. It's us. See pictures of species on the brink of extinction. See TIME's graphic "Animals Under Siege."